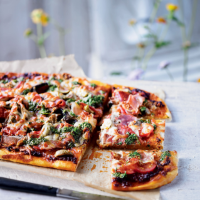 The gremolata gives this pizza a fresh and summery feel, ideal for a main course or cut into smaller squares for picnics and parties. You could also try using other Italian meats, such as salami or Parma ham. 1. Preheat the oven to 220°C, gas mark 7. Make the ciabatta bread according to the pack instructions and roll out into 28x37cm rectangle. Place on a large baking tray. 2. Spread with the sauce and add the tomatoes, then the mushrooms and olives. Sprinkle over half the mozzarella. Tear the prosciutto and lay it on the pizza. Sprinkle over the remaining mozzarella and bake for 15-20 minutes until golden. 3. Meanwhile, place the gremolata ingredients in a small food processor and blitz. Drizzle over the hot pizza and serve.